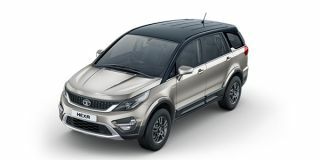 Tata Hexa price starts at Rs.13.16 lakh (Ex-Showroom, Delhi) and the top end variant Tata Hexa XT 4X4 is priced at Rs. 18.54 lakh (Ex-Showroom, Delhi). The Hexa comes with the 2.2-litre engine we’ve seen in the Safari Varicor400. The four-cylinder engine makes 156PS and 400Nm of torque that’s available with either a 6-speed manual or a 6-speed automatic. The automatic variant felt easier to drive especially because the shifts were smooth. The manual variant’s clutch keeps you guessing at first, but it isn’t hard to get used to. It can now easily switch between the four different driving modes – Auto, Comfort, Dynamic and Rough Road, for increased comfort & stability over difficult terrains. This set of modes on offer are known as ‘Super Drive Modes’. Q. I want to buy a 7 seater MPV. Is Tata Hexa a good car. Please suggest. Q. How's Hexa? Is it worth buying? True value for Money buying a Hexa. Yes it is worth buying. I have a Hexa. it is a pleasure driving it. The seating capacity of Hexa is 7. 5 star .. works very well on high speed, keeps you in control on bumpy roads . Very comfortable on low speed as well.